If you liked this show, you should follow Thyroid Nation RADIO. 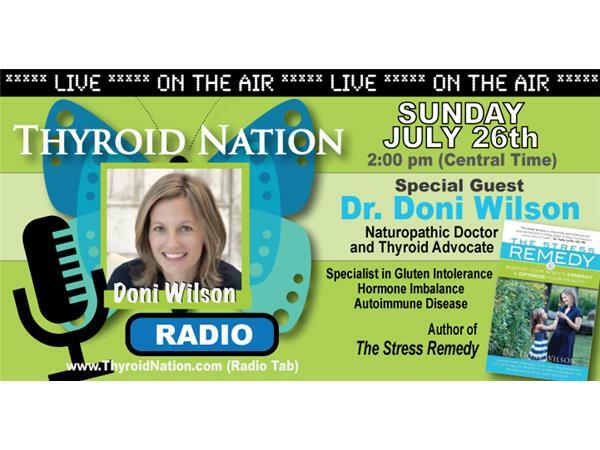 Join Danna and Tiffany Mladinich as they talk with special guest Dr. Doni Wilson of www.DoctorDoni.com and author of The Stress Remedy: Master Your Body's Synergy and Optimize Your Health. Today she'll be sharing with us exactly what Leaky Gut is. And we'll be discussing how leaky gut is connected to the thyroid, how to tell if you have leaky gut or digestion issues and explaining the link between stress, adrenal glands, leaky gut and thyroid. Also, please check out our Radio Show Facebook Group, Hashi's & Graves Thyroid Nation RADIO, where we share updated guest info, answer questions, ask questions and help empower each other.